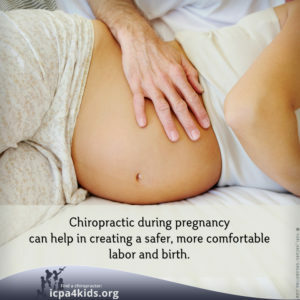 Chiropractic care during pregnancy is very safe and effective. Regular care can help expecting mothers be more comfortable and healthy during one of the most important time in their lives. Gentle chiropractic adjustments help ensure proper pelvic alignment, nerve supply to the uterus, and ideal positioning of the baby. Early on in pregnancy, the body undergoes dynamic changes in order to adapt for a growing baby. One of the biggest changes seen is a shift forward in the body’s center of gravity. This forward shift creates an imbalance in surrounding muscles and ligaments of the spine and pelvis. This imbalance leads to nervous system stress which can affect the body’s ability to function optimally. As the baby and belly continue to grow, the curve in the lower back and middle back increases, the pelvis opens, and the ribcage expands. All these changes are very important as they help ensure there is plenty of room for a growing baby but also put mom at a greater risk for pelvic misalignment. A chiropractor plays an important role in the health of a mother during this time by re-establishing natural position and mobility of joints allowing for an easier and more comfortable pregnancy and birth. Regular chiropractic care during pregnancy not only helps you stay more comfortable but can also help facilitate your birth. Regular adjustment during pregnancy have a profound effect on labor length. First time mom averaged a 24% shorter labor while mothers who have already given birth experienced 39% shorter labor times compared to the women who did not receive chiropractic care during their pregnancy. Chiropractic adjustments not only helps Mom feel more comfortable but can also help ensure your baby is in the optimal fetal position reducing the likelihood of a posterior, breech or traverse presentation. One of the techniques Dr. Lauren uses regularly to ensure optimal fetal position is The Webster technique. 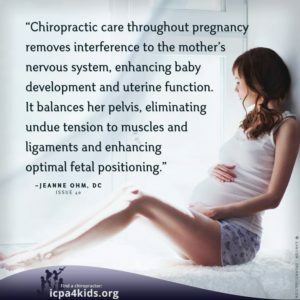 This technique is a specific prenatal chiropractic adjustment which aims to correct pelvic and sacral misalignment therefore decreasing intrauterine constrain allowing the baby to position itself naturally in the womb. Webster technique in combination with other lower force gentle adjustments and soft tissue therapies can be done safely through out all stages of pregnancy.